But finding out just what it is can be a lifelong quest. 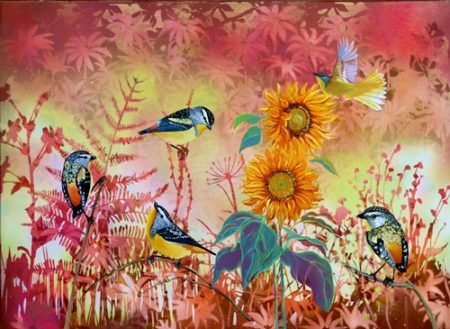 For me, the answer came when I tried just putting all the things I loved most together–brilliant colour, repetitive pattern, see-through layering and realistic painting, especially of birds. Things started to click and people began to respond positively to my work. My approach is driven by process and philosophy. Everything in the universe is really one thing, and I am a part of that thing, too. 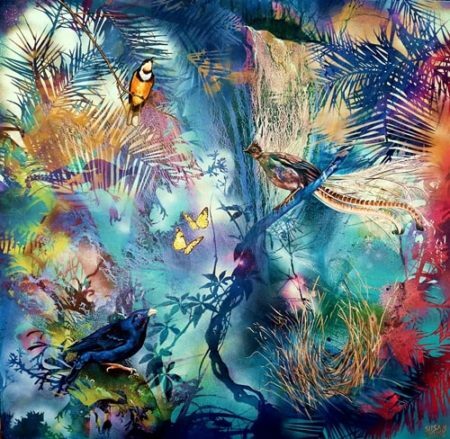 I am always looking to develop a feeling of connectedness with nature. The backgrounds in my work are very important. Rather than the viewer having an experience like looking at a photograph with everything laid out with equal clarity, I try to create the sensation of being inside an environment surrounded by receding semi-transparent layers of half-glimpsed shapes and patterns. 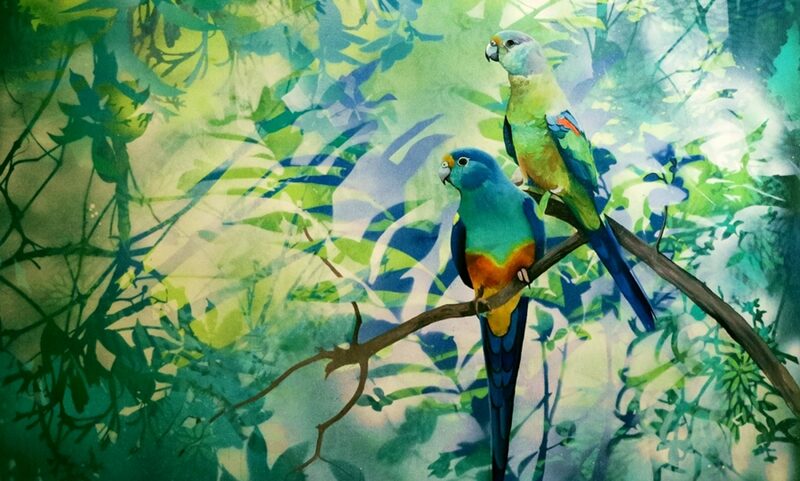 My bird subjects, painted in oils in a realistic style, are intended to “pop out” of these backgrounds, a contrasting counterbalance to their environments. It is a three part painting process. First, I lay down a loose, fluid and intensely coloured background layer in which the mingling of pigments provides the chance for happy accidents. Then I start work with aerosol paints and/or airbrush and my ever-growing collection of custom made stencils and masks. I work very much by intuition here, with no pre-determined plan, just layering colour and pattern until a satisfying composition is achieved. Then I look at it for a good long time and see what bird subjects the canvas suggests to me. The final stage is tweaking and tonal rebalancing where necessary. 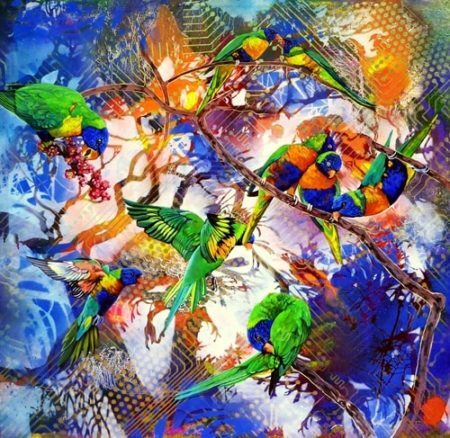 Artist Susan Skuse invites you to follow her on Facebook and her Gallery Website.